The kit contains useful information regarding identification, handling yard waste, a time of year management chart and what to do if you find Spotted Lanternflies on your property. What is the biology and life cycle? How does the quarantine order affect residents? Berks County Ag Center, 1238 County Welfare Road, Leesport, Wed. April 5th, 9:30 – 11:30 a.m.
District Township Municipal Building, 202 Weil Road, Boyertown, Sat. April 8th, 10:00 a.m. – 2:00 p.m.
Montgomery County 4-H Center, 1015 Bridge Road, Collegeville, Wed. April 12th, 9:30 – 11:30 a.m.
Center at Spring Street, 200 West Spring Street, Boyertown, Sat. April 15th, 12:00 noon – 2:00 p.m.
Lehigh County Ag Center, 4184 Dorney Park Road, Allentown, Sat. April 22nd, 9:30 – 11:30 a.m.
Brandywine Heights Middle School, 200 W. Weis St., Topton, Wed. April 26th, 6:30 – 8:30 p.m.
Ruscombmanor Township Office, 204 Oak Lane, Fleetwood, Thurs. April 27th, 6:30 – 8:30 p.m.
Milford Township Office, 2100 Krammes Road, Quakertown, Sat. April 29th, 9:30 – 11:30 a.m. The Spotted Lanternfly, Lycorma delicatula (White), an invasive planthopper, has been discovered in Berks County, Pennsylvania. It is native to China, India, Vietnam, and introduced to Korea where it has become a major pest. This insect attacks many hosts including grapes, apples, stone fruits, and tree of heaven and has the potential to greatly impact the grape, fruit tree, and logging industries. Early detection is vital for the protection of Pennsylvania businesses and agriculture. (A) Spotted Lanternfly showing the fore and hind wings (B) Resting against bark (C) Lateral view (D) Early nymphs (E) Late nymphs (F) Feeding on wild Vitis sp. (G) Weeping sap trail on tree (H) Egg mass covered in waxy coating (I) Old hatched egg mass on a trunk. The Spotted Lanternfly adult is approximately 1” long and 1/2” wide at rest. The forewing is grey with black spots and the wings tips are reticulated black blocks outlined in grey (A, B, C). The hind wings have contrasting patches of red and black with a white band (A). The legs and head are black; the abdomen is yellow with broad black bands. Immature stages are black with white spots, and develop red patches as they grow (D,E). In the fall, adults congregate on tree of heaven (Ailanthus altissima) (F), willows (Salix sp. ), and other trees, in groups of up to 20. Egg masses will be laid on medium to large trees, on trunk, branches, and limb bases. After hatching in the spring, nymphs will move off the tree and search out new hosts, including several kinds of agricultural crops. In Korea, it has been reported to attack 65 different species, 25+ of which are known to grow in Pennsylvania. Trees, such as tree of heaven and willow, will develop weeping wounds. These wounds will leave a greyish or black trail along the trunk (G). This sap will attract other insects to feed, notably wasps and ants. In late fall, adults will lay egg masses on host trees and nearby smooth surfaces like stone, outdoor furniture, vehicles, and structures. Newly laid egg masses have a grey mud-like covering which can take on a dry cracked appearance over time (H). Old egg masses appear as rows of 30-50 brownish seed-like deposits in 4-7 columns on the trunk, roughly an inch long (I). If you see egg masses, scrape them off, double bag them and throw them away. You can also place the eggs into alcohol or hand sanitizer to kill them. Please report all destroyed egg masses on our website listed below. Collect a specimen: Specimens of any life stage can be turned in to the Pennsylvania Department of Agriculture’s Entomology lab for verification. Directions for submission are on the reverse side of this alert. If you find a spotted lanternfly or a suspicious looking egg mass in a municipality where it is not known to exist, you should try to collect it and put it into a vial filled with alcohol to kill and preserve it, or at least take a good picture of it. Report it to the Pennsylvania Department of Agriculture (PDA) by emailing badbug@pa.gov or call the Invasive Species Hotline at 1-866-253-7189. Your discovery could add additional municipalities to the quarantined area. If you find any life stage of spotted lanternfly in a municipality where it is known to exist, you should try to destroy it. This insect is considered a threat to some crops and many people are working to try to prevent it from spreading. Each female will lay up to 100 or more eggs in fall, so by destroying even one female, you are reducing the potential population for the future. To see a demonstration of destroying egg masses go to: https://www.youtube.com/watch?v=WoFp_MbDiE8. In the late summer and fall, the spotted lanternfly prefers feeding on Ailanthus altissima, commonly known as the “Tree of Heaven.” They can be found feeding on other plants and trees, but if you have Ailanthus altissima, you should start searching for spotted lanternfly on those trees. For information on how to identify Ailanthus altissima and how to control it, see this fact sheet: http://plantscience.psu.edu/research/projects/vegetative-management/publications/roadside-vegetative-mangement-factsheets/3ailanthus-on-roadsides. The spotted lanternfly is not known to bite humans. You can kill spotted lanternflies mechanically, by swatting or crushing them. However, when you threaten them, they are able to quickly jump far away from you, so mechanical control is not easy to achieve. People have asked if there are any natural enemies of the spotted lanternfly. Birds don’t seem to like to eat them, and researchers have not yet found predatory or parasitic insects that are having a great impact on reducing the population. Over time, natural enemies often do find invasive insect species, but for now we are uncertain if this is happening on a level that is making a difference. Many residents are asking if they can kill spotted lanternflies on their ornamental landscape trees by using a pesticide. In Pennsylvania, regulations require that a pesticide may only be used according to the directions on the label. In Pennsylvania the label must list the site (or location) where a pesticide (in this case an insecticide) may be used. There are insecticides available with labels that list ornamental trees as an allowed site. It is legal to use them on ornamentals trees, including Ailanthus altissima, to try to kill insects, including the spotted lanternfly. You can check at your garden center to see what they offer. Some of these products may be more effective than others, so you should take note if the product you tried worked well or not. Before you purchase an insecticide, there are other things to consider. In some infested properties there are thousands of spotted lanternflies and many of them are very high up in trees. It will be difficult to reach the insects with a small can of spray or even a backpack sprayer. In this case you might consider hiring a professional tree care service to do the application. Also, when the canopy of a tree is sprayed, the insecticide may come into contact with beneficial insects, including pollinators. People are looking for more specific methods to manage pests that reduce potential exposure of non-target organisms. This type of strategy is known as Integrated Pest Management (IPM). 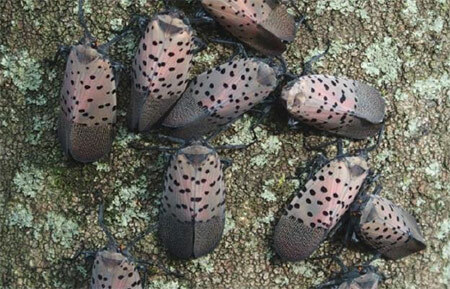 The PDA has been using an IPM strategy for spotted lanternfly infestations, and landowners may consider using the same IPM strategy on their properties, or hiring a professional service to do it. 1. Locate Ailianthus altissima trees on the site. For reasons not understood, spotted lanternfly seem to prefer some individual Ailanthus altissima trees over others. Try to identify the specific Ailanthus trees that are most attractive to the insects, based on how many are feeding on them. 2. Destroy approximately 90% of the Ailanthus altissima trees, leaving only a few that are most attractive to the insect. They will serve as “trap” trees. It is recommended that you try to kill all the female Ailanthus altissima trees, because they produce seed and contribute to the spread of this invasive tree. Be careful handling Ailanthus altissima wood, leaves, and branches. Chemicals in the sap of this tree can cause headaches, nausea, and possible heart problems. Wear gloves and protect yourself from exposure. When you cut down Ailanthus altissima trees, they will sprout profusely from the stumps and can grow back in a few years. Because they regenerate so easily, it is highly recommended that you treat the stumps with a herbicide to kill them and prevent them from sprouting new shoots. Herbicides that are labelled for this use usually contain one of the following active ingredients: triclopyr, dicamba, imazapyr or glyphoshate. Use the herbicide carefully and according to the label directions. Alternative methods for using herbicides to kill Ailanthus altissima trees include foliar sprays, basal bark applications, and a method called frill application or “hack and squirt.” For more information about these methods go to http://extension.psu.edu/publications/uh174. Whatever method you choose, remember that you will have dead Ailanthus trees which may eventually have to be removed. 3. Treat the remaining Ailanthus altissima trees with a systemic insecticide that will move throughout the tree. The insecticide must be applied according to the label and at the right time of year for the trees to absorb it. When spotted lanternflies feed on correctly treated trees, they will die. Systemic insecticides that are labelled to treat ornamental trees usually contain the active ingredients dinotefuran or imidacloprid. The PDA is using dinotefuran in their IPM strategy. Treating only a few trap trees with a systemic product can reduce the amount of insecticide used in the environment and may help conserve beneficial insects. Many sites within the infested area have high populations of spotted lanternflies. Every resident who effectively uses control measures will help to reduce the potential for this insect to spread to new territory. Prepared by: Emelie Swackhamer, Horticulture Extension Educator, Montgomery County, February, 2017.